Michelle Davies | The Journal Gazette Dave Flapan, a volunteer with the League of Women Voters, explains how to register online to East Allen University seniors Jennifer Doughman, left, and Coren Paige at lunch on Friday. There are four dozen newly registered voters in Allen County this week, thanks to the Fort Wayne Area League of Women Voters. Students at five high schools in the East Allen County Schools district had the opportunity to register over their lunch break Friday. Encouraging them to follow through and vote is the next step: In 2016, nearly 6 million people ages 18 to 29 were registered but did not vote, according to the Center for Information and Research on Civic Learning and Engagement. Early registration is key in Indiana, where the deadline to register for the November election is just four weeks from today. If you aren't yet registered, take the lead from the students who stepped up last week. Sarah Kindinger, who coordinated the voter drive for the League of Women Voters, registered students at New Haven High School, where a dozen students were so eager to sign up that they approached her table at the start of the lunch hour. She's coordinating another registration event at South Side High School on Sept. 25 and hopes to schedule one at Northrop High School. 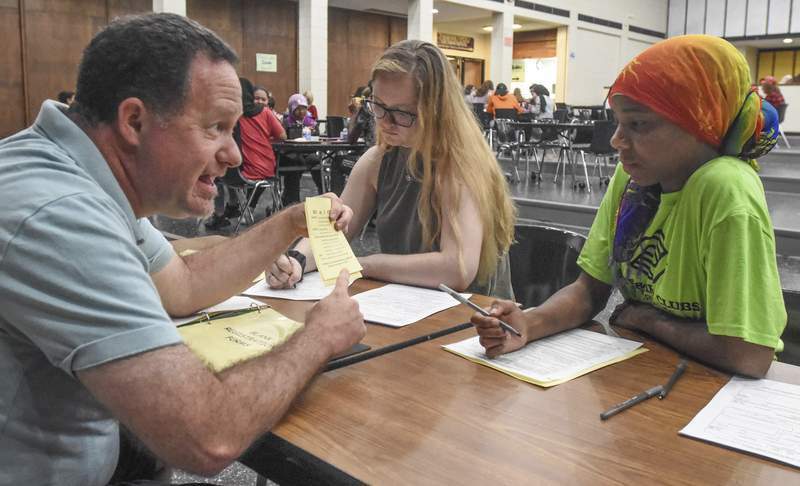 Last spring, students at Wayne, New Tech and Canterbury had the chance to register through a League-sponsored event. Homestead High School has a well-established registration program, thanks to a recent graduate. At New Haven, Kindinger said she advised the first-time voters the midterm ballot is long, with offices for federal, state, county, township and school board contests, as well as judicial retention questions and a statewide referendum requiring a balanced budget. She acknowledged most young voters will be tuned into congressional races, given the high profile of the U.S. Senate contest between incumbent Democrat Joe Donnelly and Republican challenger Mike Braun. The general election requires no such declaration, of course. While Indiana allows voters to cast a straight-party ticket in November, a provision in effect since 2016 requires voters to mark candidates in multi-candidate races. That will affect votes cast for township board members, where a straight-party vote for Democrats or Republicans won't count without votes cast specifically for township candidates. Indiana's registration policies are strict compared with other states, some of which allow for same-day registration or automatically register voters when issuing a driver's license. But Indiana has stepped up in making it easy to register or update an existing registration online. The key is to make sure you are registered by Oct. 9.